"I perfected my mix buss chains over many years and 20,000 mixes," says Chris. 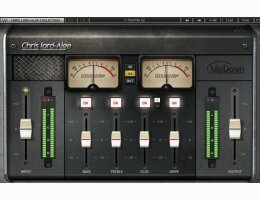 "I’ve taken my two favorite chains and put them under the hood of this simple-to-use, supercharged champion of a plugin. CLA MixDown features two flavors of my mix buss compression sound, plus console overdrive and a finishing EQ with the perfect bass and treble curves." "You can use CLA MixDown on your master channel, or you can use it the CLA way – on a master aux. You can add it after you finish mixing to secure your mix with that final touch, but I recommend you insert it before you start mixing, and then mix ‘through’ the plugin, which will help you tailor your mix and get the best sound. Either way, it will dramatically enhance your overall mix and save you precious time toward getting that final mixing touch!"